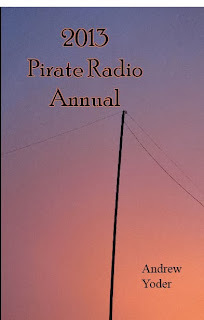 As I mentioned about a week ago, I'm now taking advance orders for the 2013 Pirate Radio Annual. Last Wednesday, I heard back from the printer that they no longer accept proprietary DTP files. It's PDF or nothing. And the printer contact sent some new guidelines for bleeds and image area. What did this mean? After about 15-20 hours of re-laying out the book again, I got it done, re-sent it to the printer and it was accepted on Monday. I skipped getting a sample copy for review, with the hope that it will speed up the process a bit. 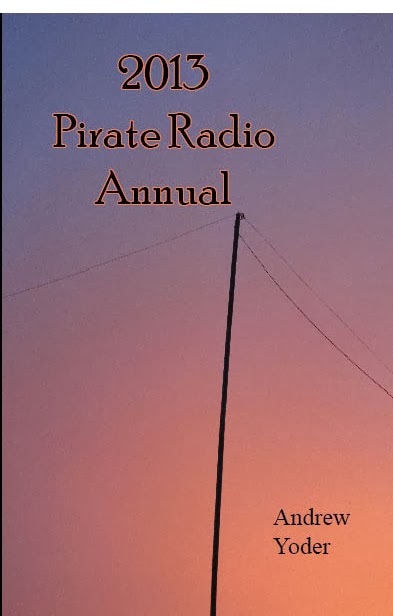 As a result of re-laying out the book, it is now coming out at 182 pages. Oh, I also received a question about the availability of previous editions. 2010, 2011, and 2012 are still available (but 2010 is nearly sold out). These older editions are $15 apiece and the shipping to the US is a flat $3 whether you buy one or four different copies.